BabyBlueOnline: Judgment is mine - says who? A phone tip on Monday led the Los Angeles Sherrif's Department to St. Nicholas Episcopal Church in Encino, California where they recovered a Rembrandt stolen over the weekend from the Ritz Carlton in Marina del Ray. The local Los Angeles NBC affiliate reported that the artwork was stolen while a curator was distracted late Saturday night. On Monday deputies found the drawing by the Master artist at St. Nicholas Episcopal Church in the office of Father Mike Cooper where it appears to have been left by the thieves. "Obviously, the pastor isn't a suspect," said Steve Whitmore, a spokesman for the L.A. County Sheriff's Department. "Someone left it there." 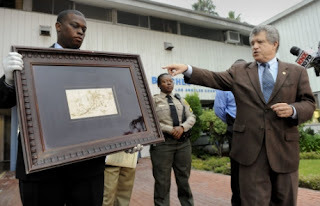 The quill pen and ink Rembrandt drawing, dated circa 1655, is valued at approximately $250,000. Why was the artwork left at the Episcopal Church? Was it intentional or done in a panic? So far there are no suspects and no arrests have been made. But the title of the drawing may offer some clues. The Judgment, by Dutch master artist Rembrandt. Read more about it here and here and here. LOL the church where I met and married my wife. Was Curate there '89-'91.